The craft room remodel is so, so close to being done. The carpet was installed last week and boy, oh boy! It looks fantastic! I’m not quite ready to give you the full room reveal yet, but you will get a little sneek peak at the end of this post. I’ve never purchased carpet before and had no idea what to expect along the way, so today I thought I’d let you all follow along with me during the shopping and installation process. Then when it’s your turn to buy new carpet, you’ll know exactly what’s going to happen. 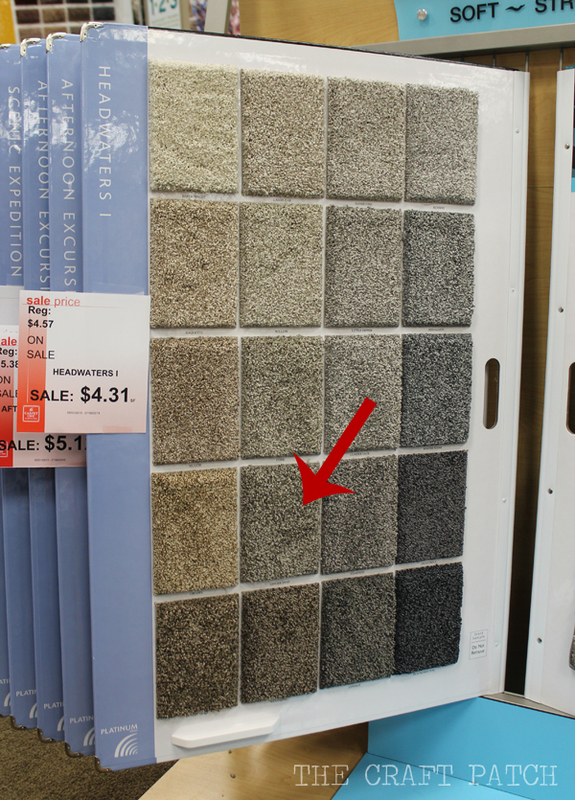 Step #1: Picking the right carpet. The folks at Carpet One were so helpful. They talked me through the different carpet types and materials. The guys at my local store have been doing this a long time and they knew A LOT about carpet! I came into the store knowing what type of carpet I wanted because I had seen it at a conference I attended. That sure made it a lot easier to narrow down the choices. 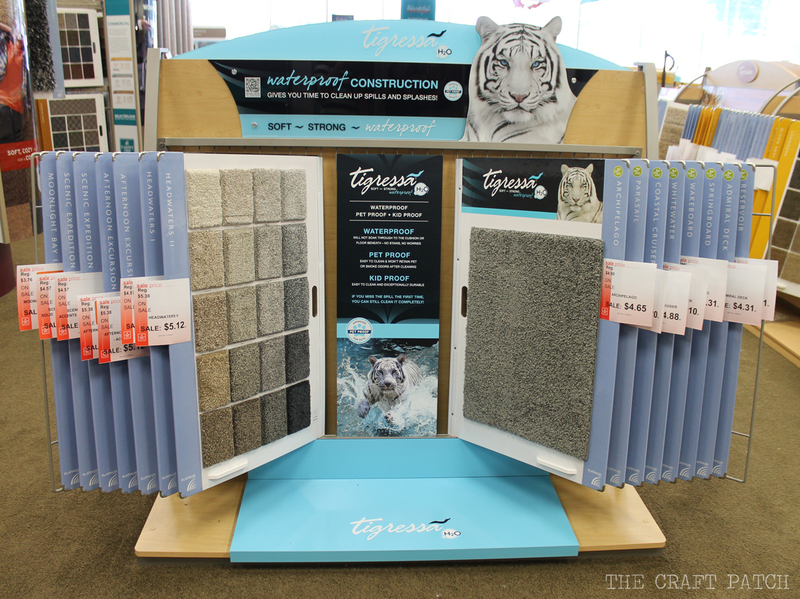 I went straight for the Tigressa H2O display (read why I chose this type of carpet). There are several different styles of Tigressa H2O carpet, so after choosing a medium length loop carpet in the mid price range, Carpet One loaned us the sample board so we could take it home for the night to pick out a color. We looked at the board in different lights, held it up next to different existing finishes in our home, and it ended up being pretty easy to choose a color… we went with Gingersnap, which is a great shade somewhere between gray and tan. I’m pretty sure it would look good with anything. We took the carpet sample board back to the store and told them we wanted to order Tigressa H2O Headwaters I in Gingersnap. A couple days later, the store sent someone out to measure the room for us to ensure that we ordered the right amount of carpet. It took him all of 10 minutes to sketch out the room and measure it, but I was glad to know that it was done right. We ordered the carpet we needed and they said it would arrive 1-2 weeks. For us, it only took about a week. 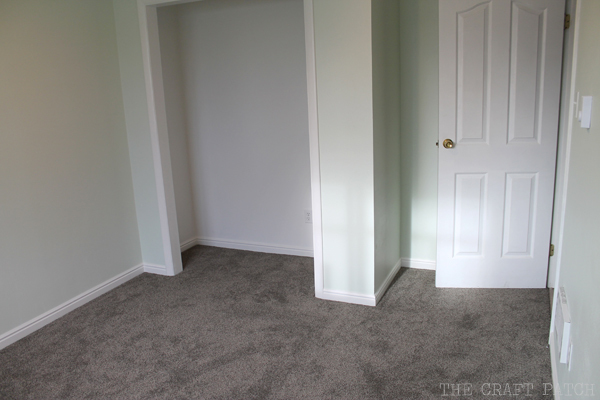 They gave us a call as soon as the carpet arrived and we scheduled a day for installation. This was the most exciting part of the process, of course. The carpet truck pulled up and a father/son duo knocked on the door. Steve and Greg were great workers. They were efficient, respectful, and even cleaned up after themselves! If you still have carpet in the room that will be recarpeted, just make sure to remove all of your furniture from the room. If you are prepping the room yourself, you should install baseboards 3/8″ above the floor before the carpet layers come. You also want to have a clean floor with no lumps or pits. We had to patch some holes in our cement floor and we scraped off a lot of drywall mud splatters. 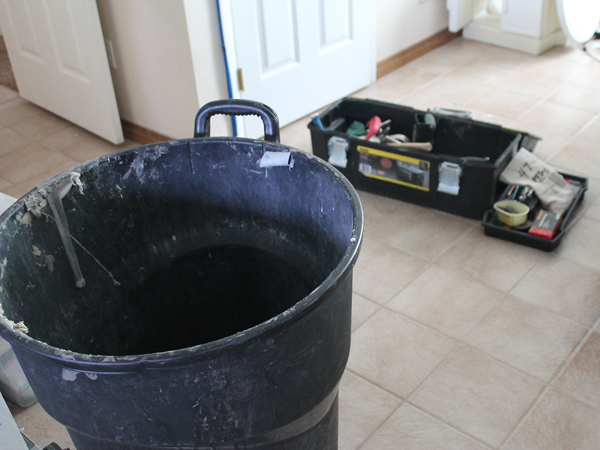 The workers will need a place outside of the room they are working on to put their tool bags and gabage can. At my house, they stashed them in the family room just down the hall from the craft room. For one average sized bedroom with two guys working, it took about 1 1/2 hours. To show you all the steps of the carpet installation, I made a fun little video. I love seeing the transformation take place in just 15 seconds! Swoon. Are you in love?!?! It's looking so great, I loved that minivid you made! Hope you get lots and lots of great years of use out of your new carpet! After the workers left, I laid right down on my new carpet. It is the best feeling ever! No one else's smelly feet have been on it… it's all mine, brand new, perfectly clean. Ah! I'm so excited that you'll get to experience it too!! !